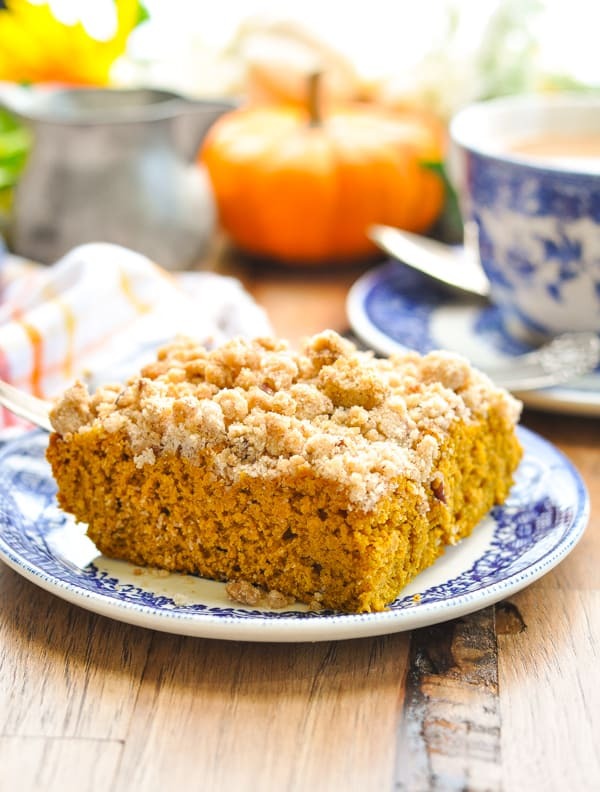 This easy, warmly spiced Pumpkin Coffee Cake starts with a cake mix for a shortcut breakfast, brunch, or snack treat! 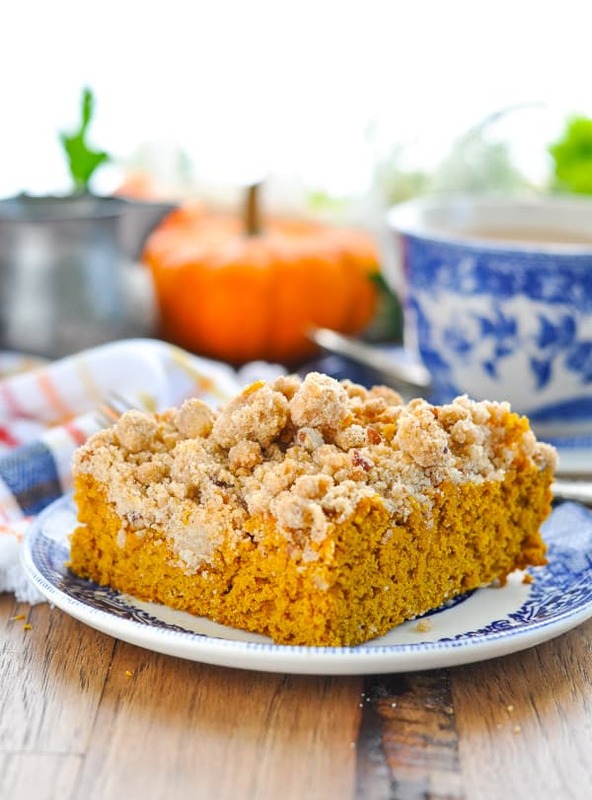 This easy, warmly spiced Pumpkin Coffee Cake starts with a cake mix for a shortcut breakfast, brunch, or snack treat! No one can resist the thick layer of brown sugar, cinnamon and pecan streusel on top! I brought this coffee cake to my friend Kristin after she had her third baby a few years ago…because what new mom doesn’t LOVE a tasty breakfast that’s ready and waiting after a night spent nursing?! Kristin sent me a text message the next day that said, “BTW, that was the best coffee cake I have ever had. Really, EVER.” So you don’t have to take my word for it. She agrees! Best of all, the cake is made with just TWO INGREDIENTS — and the crumb topping comes together in minutes. 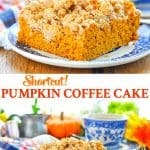 It’s really the easiest (and most delicious) pumpkin coffee cake recipe that you will ever taste! Remember my Two-Ingredient Pumpkin Muffins? Well those delicious little goodies continue to be very popular around here. So popular, in fact, that I wasn’t sure I could improve on such a simple, tasty recipe. But you know what? I think I’ve done it. A thick layer of my favorite crumbly, buttery, pecan streusel? A stroke of genius! 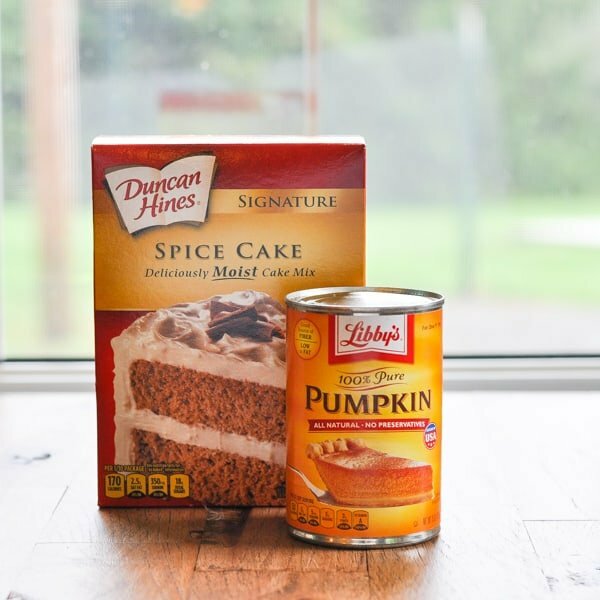 That’s right: this coffee cake only requires two ingredients: a spice cake mix and a can of pumpkin! 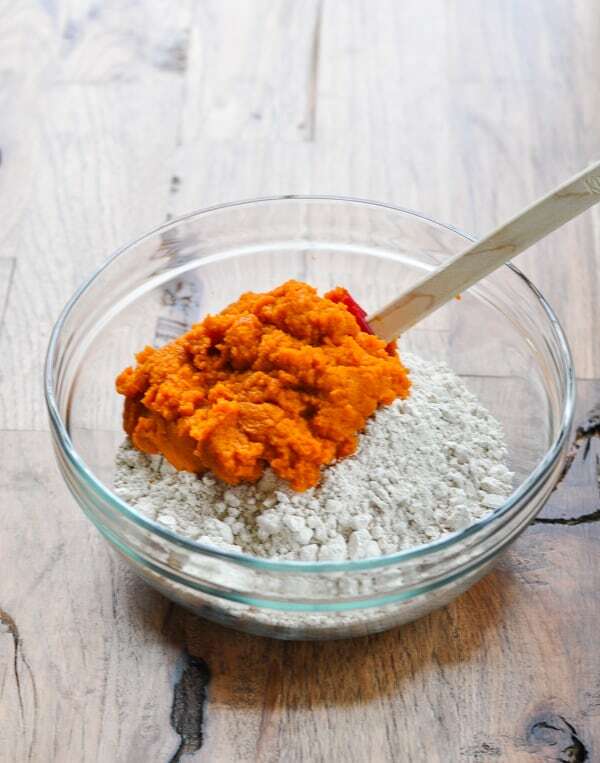 Just combine the dry cake mix with the pumpkin puree. Do NOT add any other ingredients called for on the box! I like to use an electric mixer to make sure that it’s fluffy and completely combined. You can do this all by hand — it just takes a bit longer. 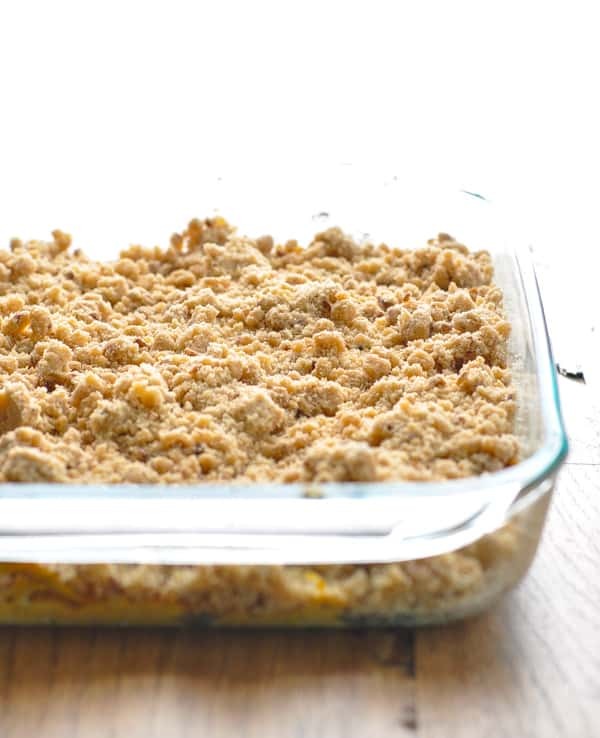 Spread the pumpkin coffee cake batter into a 9 x 13 inch baking dish (or in two separate round cake pans). Then it’s time for the pecan streusel topping! Again, this is super easy: just use a fork to combine white sugar, brown sugar, cinnamon, salt, nutmeg, flour, pecans, and melted butter until a crumbly mixture forms. and your pumpkin coffee cake is ready for the oven! The coffee cake bakes for about 25-30 minutes, or until a toothpick inserted in the center comes out clean. This recipe yields one large 9 x 13 coffee cake or you can divide the ingredients between two smaller round cake pans. Keep one for yourself and share the other with a friend (or freeze it for later)! The coffee cake is freezer-friendly, so wrap any extra cake tightly with plastic wrap and foil and keep in the freezer for up to 3 months. 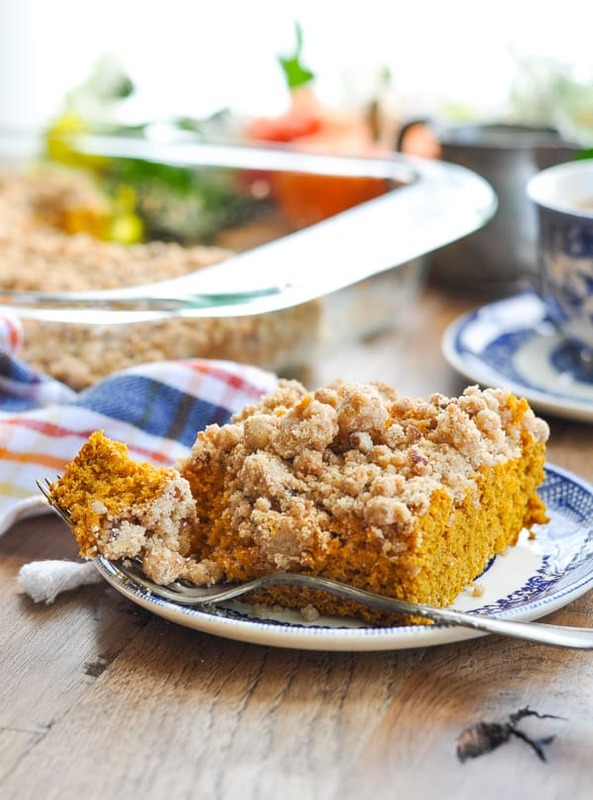 This pumpkin coffee cake with cake mix originally calls for a spice cake mix. If you can’t find a spice cake mix at your grocery store, you can substitute with any other flavor cake mix that sounds good. Try a yellow cake mix, a butter pecan cake mix, or even a chocolate cake mix! If you’re using something other than spice cake mix, I suggest adding a generous amount of pumpkin pie spice and cinnamon to the batter. I make my easy pumpkin coffee cake with pecan streusel, but you can substitute chopped walnuts or chopped almonds for the pecans, if desired. Spray a 13-inch x 9-inch baking pan with cooking spray (or 2 round 8-inch cake pans) and set aside. 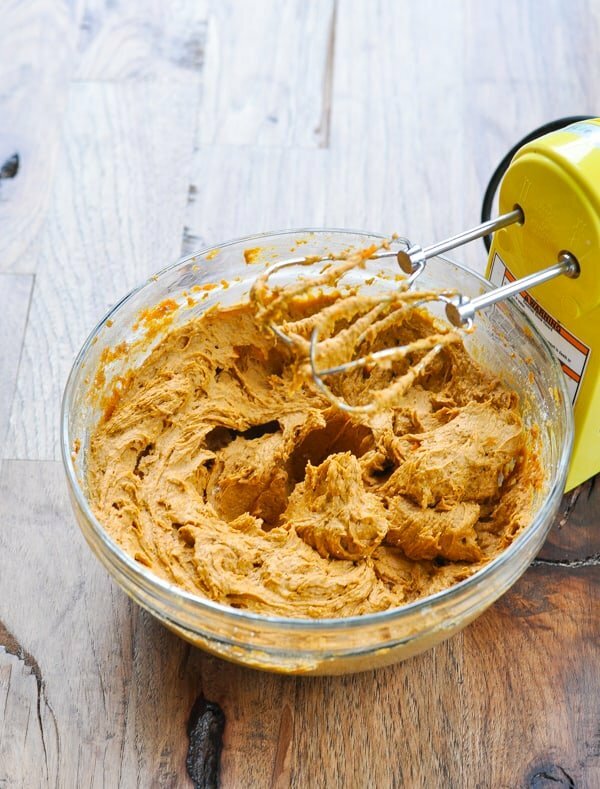 In a large bowl, use an electric mixer to combine dry cake mix and pumpkin (no other ingredients!). Batter will be relatively thick, which is fine. Spread the batter into the prepared baking pan(s) and spread evenly with a spatula. Set aside. 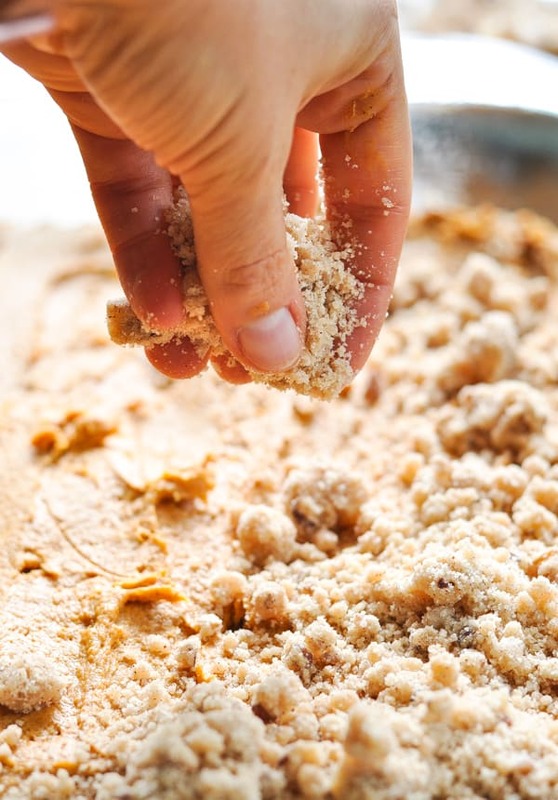 For streusel, use a fork or your fingers to combine white sugar, brown sugar, cinnamon, salt, nutmeg, flour, and pecans. Add melted butter and combine until crumbly. Sprinkle over batter. Bake for about 25-30 minutes, or until toothpick inserted in center comes out clean. 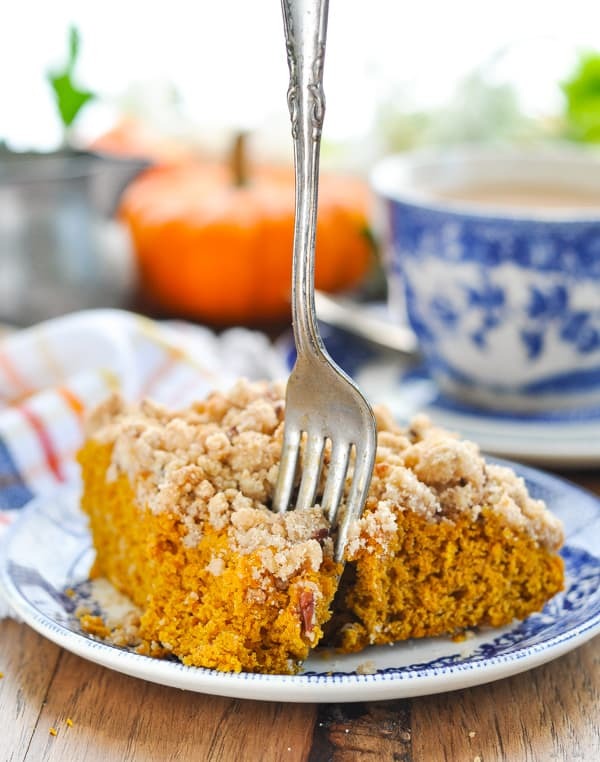 This pumpkin coffee cake with cake mix originally calls for a spice cake mix. If you can't find a spice cake mix at your grocery store, you can substitute with any other flavor cake mix that sounds good. Try a yellow cake mix, a butter pecan cake mix, or even a chocolate cake mix! If you're using something other than spice cake mix, I suggest adding a generous amount of pumpkin pie spice and cinnamon to the batter. 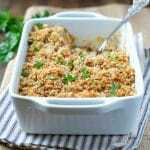 This recipe was originally posted in October, 2014. It was updated in October, 2018. The pictures of that cake are almost as good as the pics of the precious kiddos! Thanks for sharing your recipe. 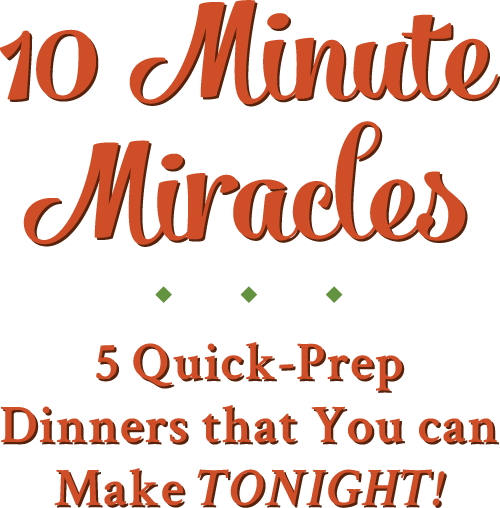 I always gravitate toward your recipes in link-ups! You speak my food language, lady! 🙂 This coffee cake looks fantastic! Thanks for sharing it. Thanks, Dee! I SO appreciate you sharing this yummy treat! Yummy! Great way to start the day right! Thanks for sharing! Pinning! Hi, Michelle! 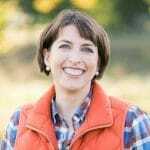 Thanks so much for stopping by and for sharing on Pinterest! Oh that looks so yummy! Especially the crunchy, sweet topping! Thank you SO much for sharing your awesomeness at Show Me Saturday! Please party with us again this weekend! Our party goes live at 7:00am EST each Saturday! Love it!! You combine two of the best things…pumpkin and cinnamon/sugar. Oh my goodness! Does that coffee cake ever look amazing! Love the addition of the streusel! I’d be thrilled if you shared this at my Creative Ways Link Party that goes live on Wednesdays at 8pm central. Hope to see you and this delicious cake there! 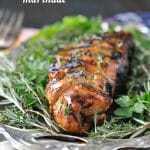 Thanks for linking with us at Best of the Weekend – I’ll be featuring your recipe tomorrow night on my blog! That’s AWESOME! Thanks so much, Deb! I can’t wait to check it out! I love that it is so easy! I’m not the best baker so the fewer ingredients for me to forget the better! Thanks for sharing it with us at #FoodieFridays! I’m not a patient baker who likes to carefully measure, Michelle…this is my kind of recipe! Yum! I love coffee cake with a streusel top! You get a little bit of texture with the delicious moistness of the cake! 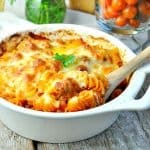 This recipe looks fabulous. Thank you for sharing! 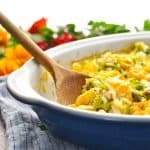 Delicious simple recipe? You are definitely speaking my language. Pinned so I can try it out soon! Thanks for linking up at Merry Mondays! Oh my, this looks delicious. I could est the streusel topping all by itself. Thanks for sharing at Foodie Fridays, have a wonderful week. Thanks for stopping by, Adelina! How large should the can of pumpkin be? I am baking it now, used the smaller size can but it seemed lacking. Hope it turns out ok.
Also, do you think a cream cheese icing could also work as a topping instead of streusel? I picked two of the easy cakes (top 2 posted) to make this weekend for the Canadian Thanksgiving. Not a baker so this is right down my alley. Thank you for the recipes. Just wondering what size can of Pumpkin, 15oz. or 28oz.? Hi Blair. 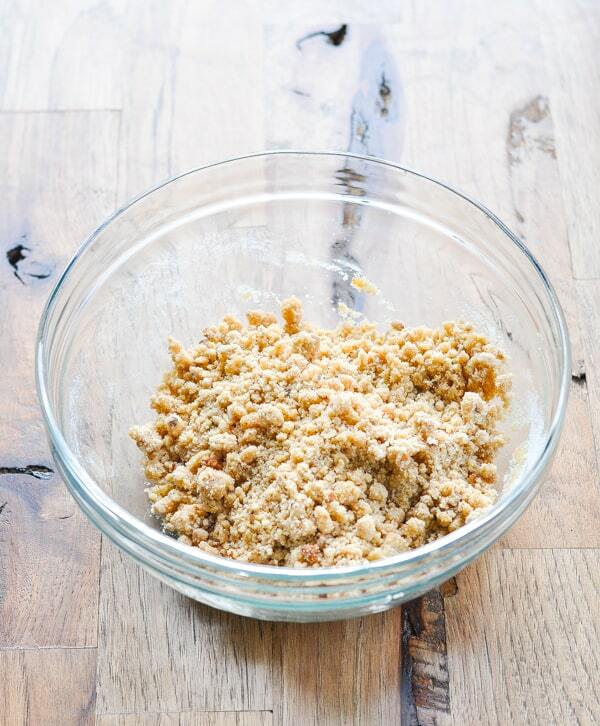 Question – is the recipe accurate that you need 1 and 1/3 cups of flour for the streusel? That seems like a lot of flour compared to the sugars. I would have thought there would be more sugar than flour. Please confirm as I”m getting ready to make this coffee cake for Thanksgiving breakfast. Thank you.